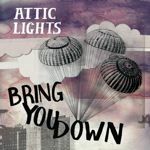 Scots alt-rockers 'Attic Lights' return with a new song 'Bring You down'. It's a jingly pop-rock song with their signature harmonies. A catchy tune with some nice string arrangements. They do, however, sound far too happy for Scots, someone must be putting something in their water! I'll have to check out the album when they finish it, hopefully it'll be full of songs that are as good, if not, even better than this. The album is currently being recording with producer Francis MacDonald (Teenage Fanclub, Camera Obscura).